I was fortunate enough to receive a special advance copy of Braddock and MrM's Ultimate Guide to Text and Phone Game. Not since reading The Game for the first time, have I actually read a full book in less than 24 hours. No book I have ever read is 100% perfect, but this is pretty close to it. 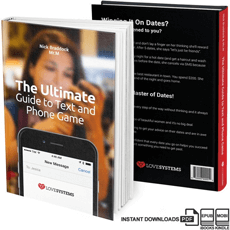 The ebook is 164 pages of solid information about how to master phone and text game. The whole theme ties back to the emotional progression model found in Magic Bullets, but takes a leap forward in several areas. It begins with a chapter on mindsets and goals, with Braddock explaining his story about how he went from hating phone game to loving it. The first time I met the guy, he had me in stitches as I listened to him talk to a cheerleader he just met on the phone. I think Braddock's light hearted approach threads the entire book together, making it really difficult to stop reading - this can only be a good thing. This is not to say that the text and phone game book isn't incredibly detailed. It is exhaustive in explaining every micro-concept in extreme detail. Real examples from various Lovesystems instructors own phone/text game experiences are continually used to cement each concept. One thing that surprised me early on was how much easier you can make the whole text/phone game process. By running solid game and including a few specific routines and techniques while getting number, you can set yourself up to have a much easier time progressing towards a date. At the end of the day, phone and text game is a tool to meet a girl you have number closer. I would therefore not recommend this book to a complete newbie. If you are struggling to open, then read Magic Bullets or take a bootcamp first. Aside from this, I would strongly urge everyone else in the community to read this book. I cannot emphasis enough how much time and effort it will save. If I had read this 5 years ago in College, I would have cleaned up. Incidentally, this is exactly how I felt after reading The Game for the first time. I guess what I'm trying to say is that this explores dating women on a completely new level. I don't feel that phone or text game are covered in enough detail in any other product in the community right now. This fills all those gaps that you sort of knew about but weren't really sure what to do/say. One of the core concepts about phone/text game is dynamite theory. This is basically categorizing girls interest based on a number of factors. There are over 40 pages on this, but simply thinking about the categorization yourself clears up so many potential mistakes. I felt that understanding why girls were behaving in different ways towards me, completely changed my mindset. By far my favorite chapter was the Sexualization one (around 30 pages) - after all everyone loves getting dirty text messages. This is something I've experimented with a lot before. There is an awesome example of a long text conversation between Daxx and a girl in LA that is MONEY! I honestly can't wait to go out tonight so I can try this stuff over the weekend. I think most people who read the book will find it to be the missing piece to a, until now, relatively unexplored area of game. Again, a certain level of knowledge of game makes the techniques much easier to apply. I honestly feel that the text and phone game book is going to fly off the shelves, so to speak. It is unquestionably ground breaking and backed up with a ton of real examples which make it near on impossible to doubt that everything you are being taught works.